PANAMA CITY (CNS) – With a tweet, the president of Panama announced the May 29 death of Manuel Noriega, a former U.S. ally who later became an enemy and dictator of the Central American nation. Noriega was 83. Noriega ruled the country from 1983 until 1989, when the U.S. invaded Panama. U.S. President George H.W. Bush ordered military action in response to worries about possible disruption of shipping channels along the strategic Panama Canal and rising tensions with Noriega, who had been indicted in 1988 in the U.S. on charges of money laundering and drug smuggling. Before his indictment, Noriega had long been suspected of drug smuggling, despite being a close friend of the United States and having worked closely with the CIA on spying efforts aimed at keeping politically left-leaning movements at bay in Central America. When Bush ordered more than 20,000 troops to oust Noriega Dec. 20, 1989, the invasion was met with outcry by many in Latin America, who denounced the action as another example of the U.S. interfering with the region’s affairs. During the invasion Noriega escaped harm, and though he was initially in hiding, he popped up at the Vatican nunciature in Panama Dec. 24, 1989, seeking sanctuary. Vatican officials said they agreed to temporarily protect him to prevent more violence but convinced Noriega to consider his options: facing the courts and wrath of Panama or the U.S. He chose to face his fate in the United States and surrendered Jan. 3, 1990, but not before attending Mass at the nunciature and then asking for a souvenir. Officials gave him a Bible. Bush thanked the Vatican for its role in the volatile situation. Since then, Noriega spent time in courts and prisons in the U.S. and France, where he was convicted on a variety of charges related to drug trafficking, racketeering, and money laundering. In 2011, he was extradited from France, where he was serving time, to Panama, where was tried and convicted of human rights violations. Earlier this year he was granted house arrest to prepare for and recuperate from an operation to remove a brain tumor. He reportedly died from a complication that resulted after the surgery. News agencies in Panama reported that his daughters, Thays, Sandra and Lorena, along with grandchildren, were nearby when he died, and said his family asked for privacy and would not release plans for his funeral. 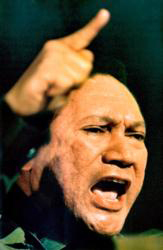 Although Noriega was baptized Catholic, he is said to have become an evangelical Christian while in prison in the U.S.